Here Come Our Firefighters! by Chris Demarest offers a behind-the-scenes tour of the station house. 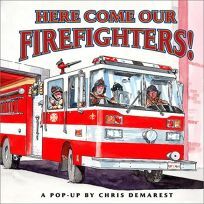 A firetruck stretches across the length of one spread that folds out into three panels; labels name each part (e.g. extension ladder and tow hook). Pull-tabs help a firefighter slide down a pole, while a pop-up highlights a burning building.